The Russian pattern must be one of the most famous — if not the most famous — designs in cut glass that was produced during the American Brilliant Period. It was ordered repeatedly for the White House, beginning in 1891 (note 1), and it graced the tables of less prominent citizens as well. These customers were among America’s well-to-do because the Russian pattern was always expensive. The image on the left shows the Russian motif combined with a convex pillar (“pod”), strawberry (fine) diamonds, and fans. It is a detail from the patented Grecian pattern by T. G. Hawkes & Company (Image: Internet). The Russian pattern spread abroad and was cut in both England and Scotland. In the latter country it is recorded as being used in 1887, but it could have been cut earlier (Woodward 1984, pp. 32, 84). There is a pattern that pre-dates the Russian pattern that is occasionally found in both pressed and cut glass. It follows the mitered outline of the Russian pattern exactly but has clear (uncut) hobnails. In pressed glass this pattern was used, usually as a motif, at least as early as the 1870s, while a cut version is mentioned by Daniel (1950, p. 184) as having been produced in Brooklyn and Pittsburgh “as early as 1863,” a circumstance that has yet to be confirmed. During the 1880s the cut version was called, variously, Star & Hobnail (Hawkes), Octagon Diamond & Star (Straus), Octagonal Diamond & Rosette (Boston & Sandwich), No. 60 (Mt. Washington), Cut Hob & Star (New England), and Hobnail & Star (Dorflinger) by companies that also cut the Russian pattern. Today this pattern, with its “clear” hobnails, is often called Russian Cleveland by collectors. But we should return to its original name when the manufacturer is known, which, unfortunately, is not often the case. Otherwise, Star and Hobnail, used generically, is a better choice then Russian Cleveland although this name can be added in parentheses if further clarification is desirable. Because the Star and Hobnail pattern preceded the Russian pattern in development, it is not, logically, a Russian variation. However, because it has been treated thusly for decades the pattern will likely always be considered a variation of the Russian by many collectors. Incidentally, the confusion that exists today between the Star and Hobnail and Russian patterns is not a recent development. In 1888 T. G. Hawkes responded to a request for the “Hobnail & Rosette” pattern (which is not on the foregoing list). 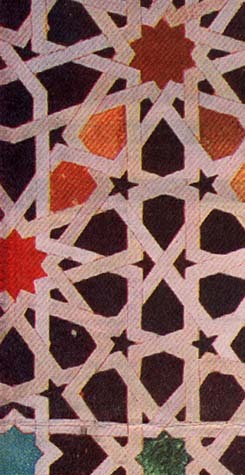 His response to the inquirer, a retailer in Washington, D.C., is worth quoting: “Hobnail and Rosette pattern we presume is the same as our Star & Hobnail, which is the same as Russian, except the small star on top of the Hobnail is left off.”(note 2) The difference between the two patterns can not be stated more clearly than this! 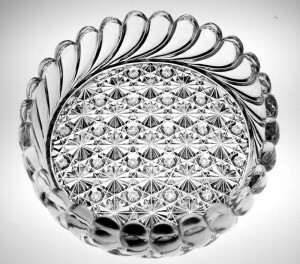 The Star and Hobnail pattern was cut by foreign companies, including the Edinburgh & Leith Flint Glass Company, Scotland (the predecessor of today’s Edinburgh Crystal Glass Company) on, among other items, a “large oval toilet tray.” One-half of the tray is shown below. The Company’s Pattern Book B lists the tray, dated April 1887, but no pattern name is given. Prior to this date, but after 2 Oct 1886, there is an undated entry for a pattern called “Cut Russian hobnail and prism”. Unfortunately it is not illustrated (Woodward 1984, p. 33 and p. 84). The Russian pattern was cut by several shops during the 1880s. The Hawkes company initially called the pattern No. 283 and probably cut it as early as 1880, when the company was founded. Late in 1881, however, its name was changed to Russian in response to a request from one of Hawkes’ major customers (Spillman 1996, p. 239). By the mid-1880s other cutting shops were also using this name, either following Hawkes’s lead or perhaps responding to similar requests from the same retailer. Today this pattern is often called Russian Canterbury. However, because Russian is the name found in most companies’ catalogs, it is the name that has come to be preferred, even though it can, on occasion, be somewhat ambiguous. The simple name Russian is what one hears most often when the pattern is being discussed — in place of Russian Canterbury — or when the pattern is considered in a general sense. Those of us who were “raised” on J. Michael Pearson’s books, however, are more likely to stick to the pattern name Russian Canterbury. If the hobnail in a pattern that has the Russian outline is cut with strawberry (fine) diamonds in place of the single star, the pattern is a Russian variation that is often called Russian Ambassador by collectors. It is well-illustrated in Feller (1988, p. 142). 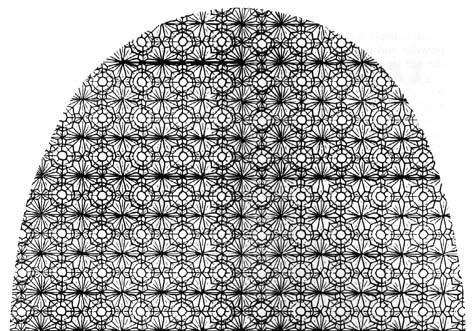 If the hobnail in the Russian pattern is cut with a tiny hobstar, the pattern, again by collectors, is often called the “Persian variation of the Russian pattern” or, more simply, Russian-Persian. It is a pattern that must not be confused with the Persian pattern, which is a design that was developed from the Russian pattern but is distinctly different. (The Persian pattern is discussed in a separate file.) Today the Russian-Persian variation is usually priced higher than the other Russian variations but less than the Persian pattern. Dorflinger called his Russian-Persian variation Brilliante, while the Straus company named its variation Polar Star or New Polar Star. Late in the brilliant period Brunswick stars were sometimes substituted for the hobstars on the pattern’s hobnails. There has been no decision as to what to call this late variation of the Russian pattern. Perhaps it should also be called Russian-Persian, but a case could also be made that it should be called something else. The problem is complicated by the fact that many collectors fail to recognize the difference between hobstars and Brunswick stars. An impressive example of this Russian variation, as used in architectural glass, was discovered by John Kohut a few years ago in St. Joseph’s Church, Albion, NY where several door panels contain a design that includes it. The panels were cut by J. Hoare & Company in 1913. Kohut illustrates and discusses the panels in a pair of articles but does not name the principle motifs in the panels’ design (note 3). 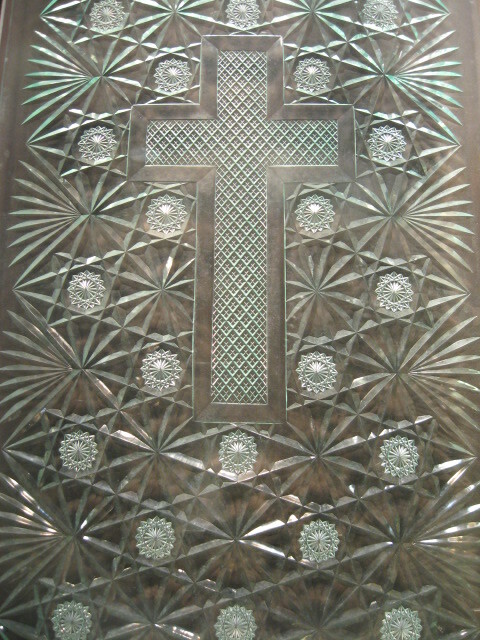 As shown in the following illustration, photographed in the Corning Museum of Glass on 1 Oct 2009, there are two motifs: a large cross that is filled with cross-cut diamonds and a surround of this version of the Russian pattern that is under discussion. Here the Russian motif is cut unusually large and at an angle that is 45 degress to the motif’s usual orientation. 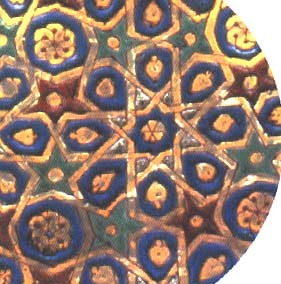 Its large hobnails are cut with 16-pt Brunswick stars and, therefore, the motif can be considered to be a late version of the Russian-Persian variation as previously described. An extra, unmounted panel from this discovery has been lent by the church to the Corning Museum of Glass where it is currently, as of 16 Oct 2009, still on display (acc. no. L.2.4.2006). Since revising this file on 1 May 2007 the pattern surrounding the cross has been identified as Normandy by Hawkes. It is shown in HAWKES PHOTOGRAPHIC FOLIO I, p. 10, on a bowl. Perhaps this version of the Russian motif, with multipointed Brunswick stars on the motifs’ hobnails can be referred to as Russian – Normandy, with Russian – Persian reserved for the motif/pattern where the hobnails are cut with hobstars. To summarize: The names of the foregoing Russian variations in bold type are those used by dealers and collectors as a matter of convenience and to avoid confusion; none can be found in the catalogs of the companies that cut them. However, because they serve a useful purpose and have been in use for decades — Daniel (1950, p. 188) was apparently the first writer to use the terms — it is not inappropriate to continue to use them, especially when the manufacturer is unknown and a catalog is not available, which is often the case. Modern items cut in variations of the Russian pattern are occasionally seen. Modern shapes, poor-quality acid polishing, and often enlarged patterns all betray the recent origin of these articles. The continuing popularity of the Russian pattern is attested to by this activity and by the decision made a few years ago by the Yasemin Cut Glass Company of Turkey to devote as much as 20% of its output of modern “American” cut glass to the Russian pattern (note 4). 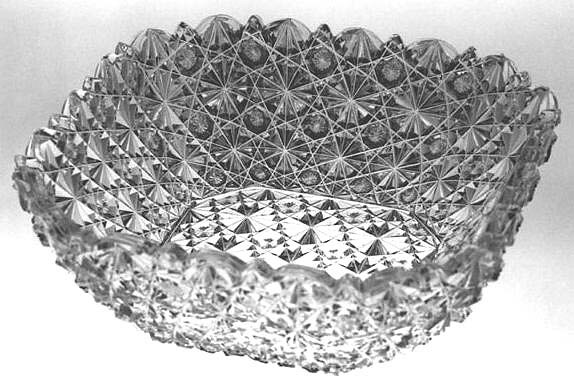 An octagonal bowl completely cut in the Russian Canterbury pattern. Manufacturer unknown. Top D = 8″ (20.3 cm), H = 2.5″ (6.4 cm), wt = 2.25 lb (1.0 kg). Sold for $300 in 1989. Nappy cut in the Russian & Pillar pattern by T. G. Hawkes, c1885. The pillars in this example have been cut on a plain (non-figured) blank. After c1905 companies such as J. Hoare sometimes used figured blanks that incorporated this motif. Today this short-cut is seldom identified, with the result that faux “pillar-cut” patterns are often offered at inflated prices. This is not the case here. D = 9″ (22.9 cm), H = 2″ (5.1 cm). Sold for $699 at an eBay auction in 2006. Old Islamic designs that are similar to the Russian pattern: The example on the left is enamel on glass, fourteenth century (Image: Corning Museum of Glass). 1. Correspondence on file at the Rakow Research Library: Letter from T. G. Hawkes to Messrs. Wilmarth & Edmonston, 6 Nov 1888. 2. Recent evidence reported by Spillman (1996, p. 246) indicates that an earlier White House order, one placed in 1885, was not cut in the Russian pattern as has been generally believed. Spillman considers that this earlier order was a supplement to the service — cut and engraved in the so-called Lincoln pattern — that was originally ordered by the Lincolns in 186l. 3. Kohut, John, 2003: John Hoare’s architectural cut glass, The Glass Club Bulletin, No. 197, pp. 8-12 (autumn). A partially re-written article by this author, with the same title appears in The Hobstar, Vol. 27, No. 3, pp. 16-20 (Nov 2004).